He is very pleased as he considers this a sign that he is all grown up. 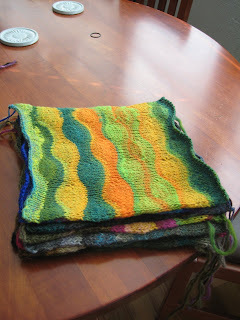 I have been waiting for Yarndogs to get a copy of Berocco's Norah Gaughan Vol 3 to cast on my new project. It is Loppem by Norah Gaughan. 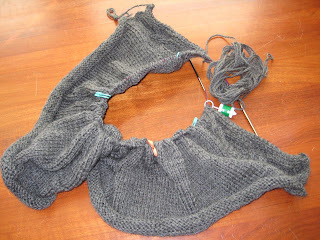 I am knitting it in Cascade 220 which I had bought a couple of years ago to make sweaters for the boys, before the realization that handwashing sweaters for my own wee hooligans would not be the best idea. I, by contrast, don't tend to get my clothes actually dirty very often so handwashing is not a problem. I had seen a sleeveless waistcoat in the shops in the UK and this is my alternative...the one in the shop (Fat Face) was grey, so this had to be grey also. I seem to have acquired a 2nd edition of the book, which looking at the errata and comments on Ravelry, is a good thing. 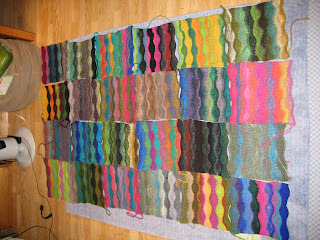 ready to be laid our into a suitable patchwork..
...and then for the task of seaming and knitting the edging. I have chosen an olive green colour as the edge as I thought that would best tone with the mixture of blues, greens, and browns, as well as the more brightly coloured squares. Glamour - I has it! I finished my turban. Here I am posing in front of our 1946 poster exhorting americans to buy war bonds. The poster is the same age as our house - and not far off the date of the pattern. The pattern is this one from the V&A knitting pattern collection. Christina, of course, has an original version of the pattern...but as it happened I knitted it from the pdf on the museum web site. 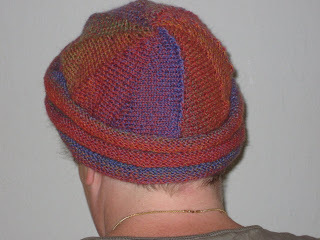 The yarn is Jojoland melody, and the hat took 1.5 balls. I knitted it on 3.25mm needles. 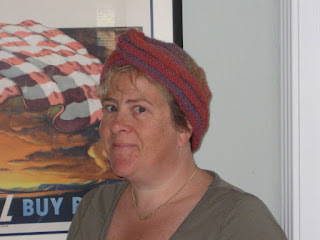 The only modification to the pattern was to knit only 9 of the 10 short-row sections on the cap, and actually it would fit me better if I had knitted only 8 of them. 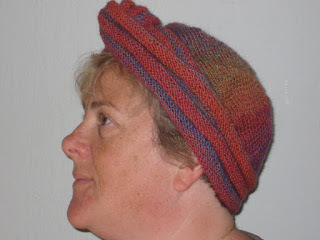 I am pretty sure I will actually wear this hat: the colours, and I think the style suit me. I am wearing it quite far back on my head in these photos but it also pulls down over the ears and the bandeau is warm over the ears.... ideal for skiing. 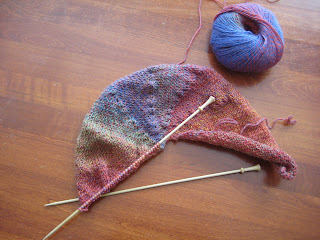 I thoroughly enjoyed knitting this; it was quick but an interesting knit and I'm pleased with the outcome. Please do not tell me that I look like Ena Sharples ...she wore a hairnet! I've cast on for this: vintage knitting pattern and I'm knitting the one on the right... I think i'm going to look very modish in it. 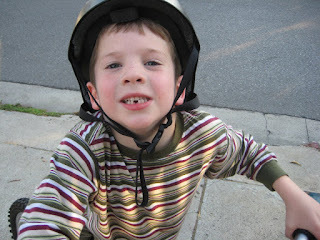 Adam walked aand ran 3.25 miles in an hour, and Finlay managed 17 laps of a much shorter track. 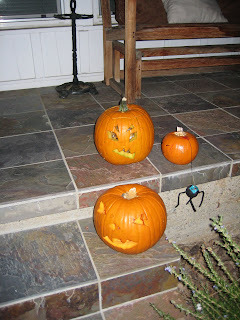 Both had a great time! 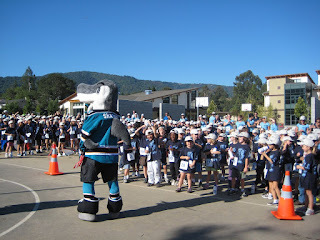 The best part...Sharky (local hockey team mascot) came to cheer them along! This weekend was the first scout camp for our new scout. 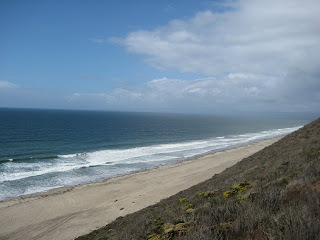 We all went along to Sunset State Beach with about 20 other families. The location was lovely, the campground is actually on sandy dunes behind the beach, so is sheltered from most of the wind, but close enough so we could hear the waves crashing on the shore. 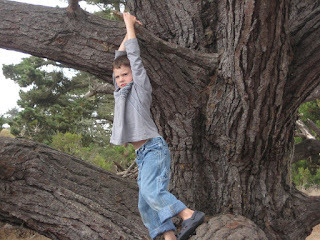 Adjacent to the group camp site was a large area of trees and scrub, ideal for small boys rampaging around building camps, and traps, and climbing trees. While we were there Adam did his frisbee badge! 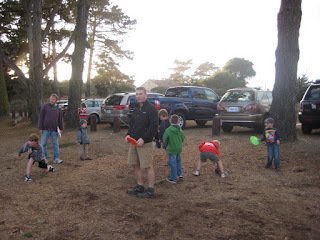 Naturally there was also a barbeque and camp fire, compete with smores and campfire songs. 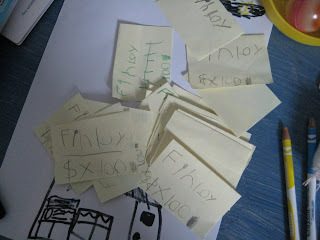 Finlay is now word-perfect in "Take me down to the ball game"...so he's all set for next year when he can join cub scouts. 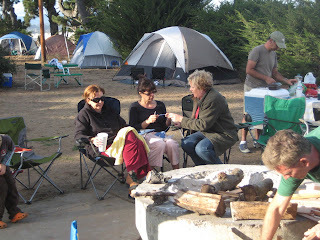 Not only did I get a chance to sit by the camp fire and knit - but I met another knitter! Altho it rained on Saturday morning, by the time we got to the site it had cleared and the weather stayed fine for the rest of the weekend. It rained this weekend for the first time since about April. 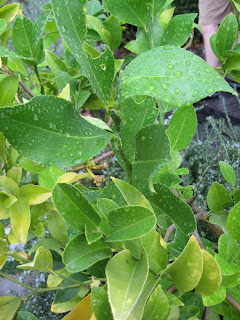 The garden smelled lovely in the morning; so clean and fresh. Not such great timing for the scout camp however! 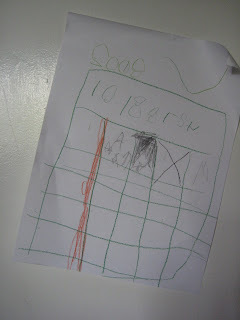 This chart is for signing in and out, it's stuck to the back of his door. I don't believe he is using this as rigorously as he said he would! These are the access passes: green if you want to go outside, and brown to stay in the house. You will notice these have a nominal value of $100...and he is obviously anticipating a large demand...there are about 20 of these. I forsee a career in the civil service for my boy!